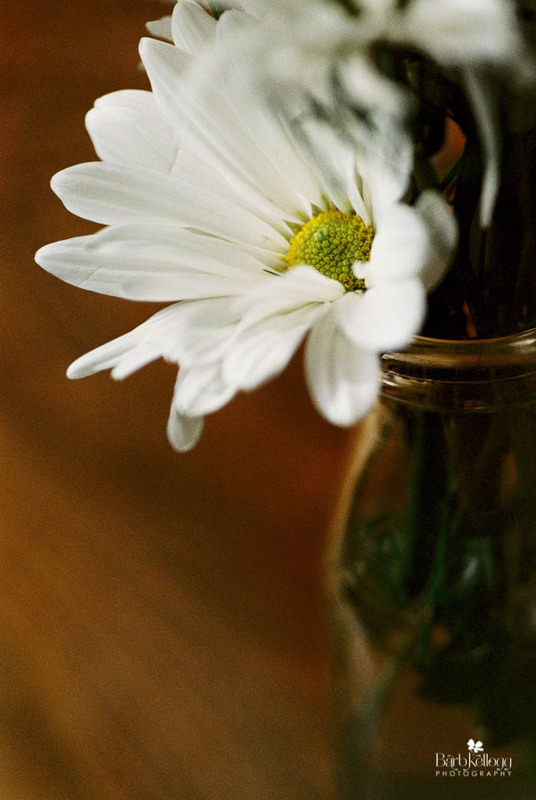 "Romantic Daisy", by Barb Kellogg. Click for larger view. And it's available in the Shop. The trees in my area aren't quite ready to be photographed in their fall colors, but I figured you wouldn't mind more flowers. This little romantic lovely was photographed with film. I'm really loving the softer quality and colors of these images. Right now it's all still very new and experimental for me. I'm going to keep bringing you more, in addition to still shooting with a digital camera. Based on a few questions I've answered about film, I thought I'd share this with you about how film works in the digital age. The one thing with film that takes little bit to get used to is that I don't have the flexibility of changing my ISO from frame to frame to get slower or faster shutter speeds. The ISO is set for the entire roll. The photo lab has to treat the entire roll of film the same; they can't adjust developing time on a frame by frame basis. All 36 frames sit in the same bath for the same amount of time. So I either shoot an entire roll all at once, or I wait for similar lighting conditions and the frames are shot across many days, weeks, or months. So far I've just been shooting the entire roll, because I'm still in my experimental "what does this look like if I set my camera this way" phase. What is ISO at it relates to film? More info at this link. The lab I'm currently using (because they're awesome) takes about seven to nine business days for me to receive my scans. (Their main clientèle are wedding photographers, and this would still be prime wedding season in September. My nature work, and hopefully some portraits soon, go into the queue just like everyone else.) I receive the digital images as jpg files from the film lab to download after they develop it and scan the negatives so I have digital versions. I also have the option to have my developed negatives returned to me. I was so thrilled when I saw these images. The lack of immediate feedback is something to get used to, though. I admit I work harder to create more "keepers". The image above, Romantic Daisy, was only retouched ever so slightly. The darker areas were a little too dark, so I did lighten the shadows just a tish. I'm always open to fielding questions from you! You can comment below, or email me.